Darin Dowd has been a hard worker all his life. Although he operated his own business for 10 years, it left him little time for his family. Jennifer Dowd was busy as well, raising their four children. Besides family time, the couple needed to earn more income. Jennifer was introduced to ACN by one of her friends. She blew the friend off for three months. But one day, her friend called her from an ACN international training event, and Jennifer could hear the excitement and energy in the background. Jennifer and Darin decided to attend a presentation, because they didn’t want to hear about her friend making millions and say to themselves, “We should have done it.” Jennifer says that the most expensive thing in life is a closed mind. They fell in love with ACN from the beginning. Her friend had success quickly due to a hard work ethic. So their goal was to do what her friend did. In four months, Jennifer and Darin were making an income that not only matched Darin’s income, but doubled it. Darin said that not only has network marketing given them freedom, but it has also given them choices. Before, he couldn’t choose about the hours and traffic he had to put in to earn a living. Now, he does. They love to go boating with their children, and if they want to do so two or three times a week, the family can do so. The perks of having an awesome home-based business (Darin’s words) is that he can be at home, available to his children. Their workday consists of sitting by the pool, making phone calls while their children are playing a game of pool volleyball. Although it doesn’t seem like it, they must be working hard. Not only do they earn $110,000.00 per month in residual income, but both hold the position of Senior Vice President, and the couple is 2015 Circle of Champions members. They are truly thankful for the opportunity to show family and friends the wonderful network marketing opportunity that ACN provides to achieving time and financial freedom. Jennifer & Darin believe that they are serving as the type of leaders they were always meant to be. I have talked about the dynamic direct sales company ACN before, but it bears repeating. For me personally, I see the pull towards this telecommunications and energy business, because of what it provides. There is absolutely no way you can’t make any money with the ACN multi-level marketing business…IMHO. ACN was established in 1993, by four businessmen who were not happy with the relationship marketing companies that were in the industry. In the beginning, it was referred to as the American Communications Network, and it only had 20 ACN consultants. When the business extended overseas, it just became ACN. Moreover, its headquarters moved from Farmington Hills, MI to Concord, North Carolina. The European operations include 24 countries on four continents. At first, customers could purchase gas and electric services, but in 2006, ACN sold its energy assets to Commercial Group. 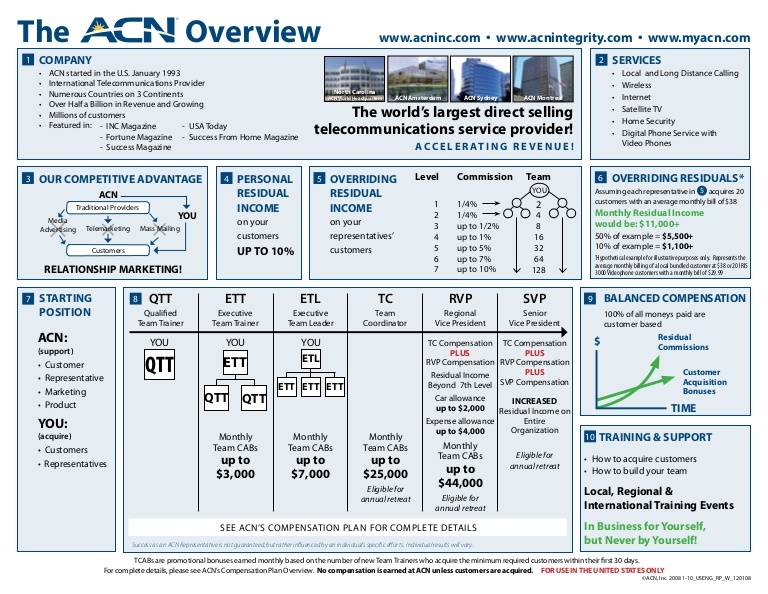 You will be happy to know that in 2011, ACN got back into the energy reselling market. In 2013, the company’s revenue was totaled at around $700 million. ACN compensation plan is typical of most other MLM businesses. Independent business owners earn compensation for every service their customers sign up and pay for on time. If any customer decides to enroll as an independent business owner, bonuses are only received if services are acquired. You don’t receive any bonuses just for recruits. You can only earn bonuses from signing up customers. Another thing that ACN makes real clear is that not every ACN consultant is going to earn six-figure residual income. You aren’t guaranteed anything. The only way you will prosper is to work hard at signing up customers and training your team on how to acquire customers. To distinguish itself from other MLM businesses that are nothing more than pyramid schemes, ACN holds membership with the Direct Sellers Association. Furthermore, the company organized a legal team of attorneys who specialize in MLM and works with three attorney generals to guide them with legal advice. When ACN states that it conducts business with honor and integrity, it means it. All of the top ACN earners say that the simplicity of the program is what keeps them going. They earn money for signing up customers for services they already use on a daily basis. There is no need in trying to convince customers to purchase face creams, nutritional supplements, or weight loss powders that might or might not work. Also, for every service a customer pays for, a portion of the proceeds go to ACN’s Project Feeding the Kids program. A network marketing business that takes care of its customers, community, and consultants; it doesn’t get much better than that. Is ACN a Good Company to be in? I am often surprised, albeit pleasantly surprised, when I hear of people and places that motivate others to do well, be their best. In a society in which bad or negative news gets the most attention, it is refreshing to hear good news. And even more nice when hard work is rewarded. As I have often done on my blog, I have written stories about people who didn’t know where their next paycheck was going to come from. I know from experience, you feel anything but happy and positive. You want to scream in anger and agony. But I noticed none of these folks stayed angry. For a moment, they allowed themselves to be mad. They quickly got over it, because they realized that it served no purpose. My point is that holding a grudge doesn’t hurt anyone else by YOU. You can’t move on in your career, your dreams, your life, until you let that negativity (hurt, anger, etc.) go. This is why I noticed that multi-level marketers tend to congregate with other multi-level marketers. The one thing I have read over and over again is the goal to inspire and motivate each other. At the events, Jennifer said she could “hear” the positivity in the room. WOW! Everyone cheering, congratulating, and just genuinely happy to see each other; what a rarity. Well, in the ‘normal’ world it is, but I have found that it is commonplace in any MLM meeting. They want to get you all hyped up so that you are able to go out and bring that specific opportunity to the masses, aka: your friends and family. I am going to say this, and some of you all know this is true. If you attend a church regularly, you know that some churches have more mess that goes on in it than any other place on earth. And although it should be, you sure don’t always have church members cheering, congratulating, and genuinely happy to see each other. There is a comedian who has a joke that he learned how to cuss as a young child by attending church…LOL (more like a chuckle). This is the reason why some churches are in such disarray. There is so much animosity, backbiting, gossiping, and jealously that there have been physical altercations and other disconcerting events. If you are supposed to be the example to the world, how does it work when this type of nonsense is going on? Once, I read about this famous singer/dancer who had an entourage of quite a few people; I believe it was over 150. He said that he tells his folks that he is running a business. Therefore, he didn’t care if you were mad at your spouse/significant, your child/children, or the world in general. When you stepped into the studio for rehearsal, you leave your issues at the door. He told them that your bad attitude and surliness messes up the vibe for everyone else, and this didn’t work for him. I am so not mad at this! I wish all place, especially corporations and churches, would say the same thing. Maybe they would operate a whole lot better, and people wouldn’t be so unhappy. Have you ever been in a place where the positive energy was just radiating off the walls? I have, and let me tell you, it is remarkable. People smiling everywhere, and welcoming you, regardless if they know you or not. You feel good, and even if it is your first time visiting, you are cheering and clapping for individuals you don’t even know. It is a one-of-a-kind experience, and if you ever get the chance to attend an event and be around people like this, I recommend you take it. But enough on my little rant…..back to our story. 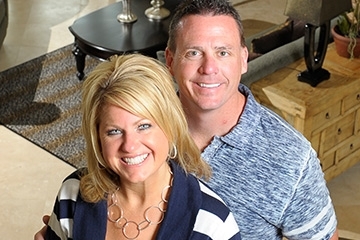 Jennifer & Darin Dowd took a risk when they decided to join ACN. But as Jennifer said, they don’t regret it for one moment. The only way you will ever live a fulfilled life is to step out on faith, and try something completely different than what you are used to. You have nothing to lose, but you have everything to gain. Life isn’t about playing it safe all the time. And I have never understood, for the life of me, what it means to play it safe. What, to keep doing the same thing over and over again? I remember at one point in my life, I was dating this person who never wanted to try anything new. For example, if we ordered a pizza, it had to be the same kind each and every time. If I suggest we try something different, it was met with a frown face. You know I had to let this person go with a quickness….LOL. That isn’t me, and I am thankful for it. If it is time to take assessment of your life, and if you are not where you want or need to be, there is no time like the present to make some changes. You have to step out of your comfort zone. What are you doing to change things in your life? Are you stepping outside of your comfort zone and moving forward to a better future for yourself. If you are, what sort of things are you doing to do this?